I’ve hit pause here. I know, I know, books don’t have a pause button but with English, it is an evolving language that absorbs and incorporates all within its path, much like the Borg. I’ve had to take a brake from Unfinished Tails in part because, for me, to appreciate Tolkien, I have to take him in spurts. His writing seems to be so in-depth that I find myself having to grab my phone or computer to look up on the internet a map or a character (yeah, I feel weird looking anything up with my phone and not saying “I dialed 411 or 0). Alas, because of life’s situations, I’m more busy right now and if I was to continue to do this throughout the book I’d never finish and would never be able to contribute to BookLikes, which we be the greater of the sin! More on Tolkien writing: When I read the Lord of the Rings trilogy - and yes I started with The Hobbit like you’re supposed to – I found that Tolkien is intense. He has maps of his world, people with their own lore, and his own language. These are the things that make for a slow read. At least Lord of the Rings had a narrative. 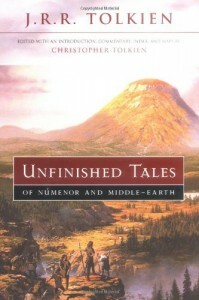 Unfinished Tales – as the title suggests is a collection of his unfinished tales – is more of a history book, or really “short” stories. The last story I read in the book was “The Children of Húron,” which was finished by Tolkien’s son Christopher and made into its book of its own right – which I had already read but remember none of. The amount of effort that I put into the book – and the constant drive to want to play Skyrim – is what finally made me pause the book as a whole. I couldn’t read more than a few pages at a time, I constantly had to flip to the notes pages - yes he added notes at the end of the tales -, and I had to search for what he was referencing so I could follow along. I sound more frustrated than I am, which frankly is the opposite. I loved the way that I felt more interactive with what I was reading. The searching for information kept me going. But like I said earlier I am rather busy right now readjusting and would like to actually finish a book and then go back to reading Unfinished Tales.